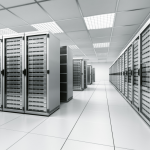 Server colocation services available with custom designed colocation cages and highly redundant bandwidth. Backed with SLA terms and reporting capabilities. With our world-class server colocation hosting solutions, we offer clients an unmatched colocation experience backed with ultra-fast network. Our Tier III Date Center is the best place to host your critical applications and servers in full security ample space. We provide businesses a highly sophisticated collocation facility in our state-of-the-art Data Center. When you are with BrainPulse, you need not to spend extra on network and support service. Since 1997, we have been offering our clients' colocation facilities in a very robust and secured environment. Our expertise in IT infrastructure helps us to deliver customers fast and reliable bandwidth connections for fast data transmission in India. Our solutions are feasible for organizations with sizable hosting requirement but no infrastructure to place their hardware / software /servers. With collocated servers, they can now reduce growing bandwidth cost. Why You Should Consider BrainPulse ? We put the core focus on high-availability network and carrier connections to enable clients access their web sites conveniently. With mountable racks, dual power supply servers and stable web hosting service environment, we ensure quick deployment of server infrastructure for them. To know more about our colocation plans and Data Center service, call us or send us your business queries. Our hosting team will get back to you within 24 hours.